Incorporating high-quality Japanese sound-generating technology and keyboard mechanism, the new PRK line offers the first Chinese digital pianos in the mid-market sector. Pearl River’s Japanese-made ‘Balance Design’ wooden cabinets enhance the sound as well as offering a stunning yet compact addition to any room environment. At the heart of the PRK piano lies the digital sound and keyboard technology from one of the highest-level designers and makers of electronic music instruments. 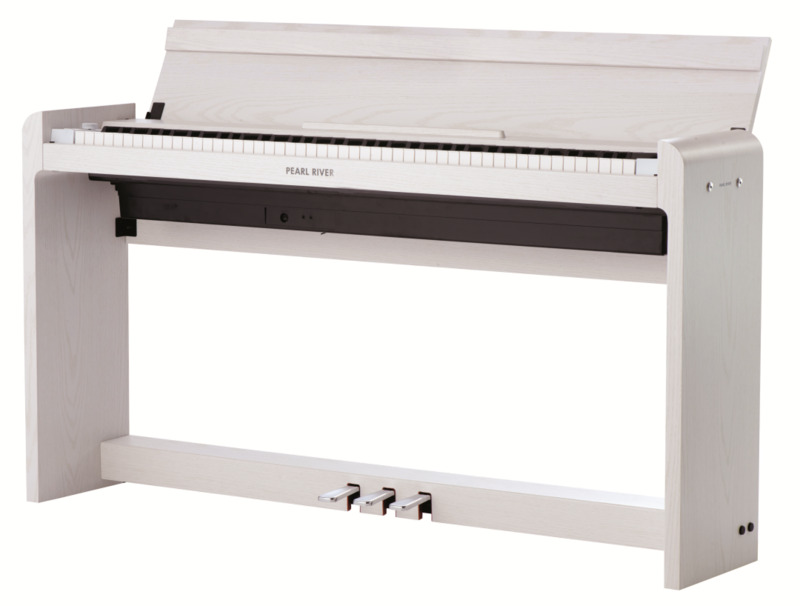 The PRK-80 keyboard is a naturally weighted hammer (NH) action which reproduces the touch and feel of an acoustic piano. The ten voices have a maximum 120 polyphony to fully experience their depth of tone. With over 60 years’ experience, Pearl River has used the wood-crafting skills of its piano makers to unite the sound of an acoustic piano with digital stereo sound reproduction. The PRK-80 has a contemporary, slimline, rounded profile cabinet with three integral pedals. Full keyboard cover is available in luxurious black or white satin finishes with chrome colour pedals and fittings.